Another of the many Italian dishes in the cucina povera tradition, sugo finto is “fake” because it is basically a meat sauce (sugo di carne) without the meat that was so unaffordable for most people not too far in the past. (It is also called sugo scappato, or ‘escaped’ sauce, for the same reason.) Today we enjoy sugo finto less because it’s economical and more because it’s also really good eating. And simple. The typical flavor base of finely chopped aromatic vegetables is enhanced with fresh herbs, then doused with red wine before the tomatoes are added and simmered for 30 minutes or so, long enough so it reduces into a rich, thick sauce. Sugo finto is extremely versatile. It goes with just about any pasta, and has a place at the table any time of year, made with fresh tomatoes in the summer months, canned or hothouse ones the rest of the year. Finely chop the onion, carrot, celery and herbs together into a rough paste—what they call a battuto in Italian. You can do this in a food processor or, in the traditional way, using a knife or mezzaluna (see Notes) on a wooden cutting board. In a saucepan or braiser, sauté the battuto gently in olive oil until it is perfectly tender, taking care not to brown the onions. A pinch of salt and a few drops of water as you sauté will help things along and avoid browning. Add a splash of red wine and let it evaporate. Then add the tomatoes to the pot. Let simmer for a good 30 minutes or so, stirring from time to time, until you have a nice, thick sauce. Serve with the pasta of your choice. This sauce starts out as so many Italian dishes do, with aromatic vegetables finely chopped together into a kind of paste that Italians call a battuto. Almost always, the battuto is then sautéed in fat until soft, at which point it becomes a soffritto, the foundation for countless sauces, braises and other dishes. You can make your battuto at least two ways. The modern, time-saving way is to use chop the vegetables very roughly and then chop them more finely in a food processor using the pulse function. This makes short work of what used to a fairly laborious job. But at least once in a while it’s nice to take the time to make your battuto the old fashioned way, using a ‘half moon’ chopper like the one pictured here. You roughly chop the aromatics with a knife, then rock the mezzaluna back and forth over the vegetables in a criss-cross pattern until you reach the desired consistency. It takes a little more time—say, perhaps ten minutes if you’re taking it slow—but I find it satisfying, and rather relaxing when I’m in the right frame or mind. This sauce is very versatile. You can use it with just about any pasta you like. A quintessentially Tuscan choice would be pici, made from a flour and water dough hand-rolled into spaghetti-like strands. But it is very nice also with fettuccine or tagliatelle, riffing off the meat sauce joke. Short pastas like mezze maniche or rigatoni are also very nice. 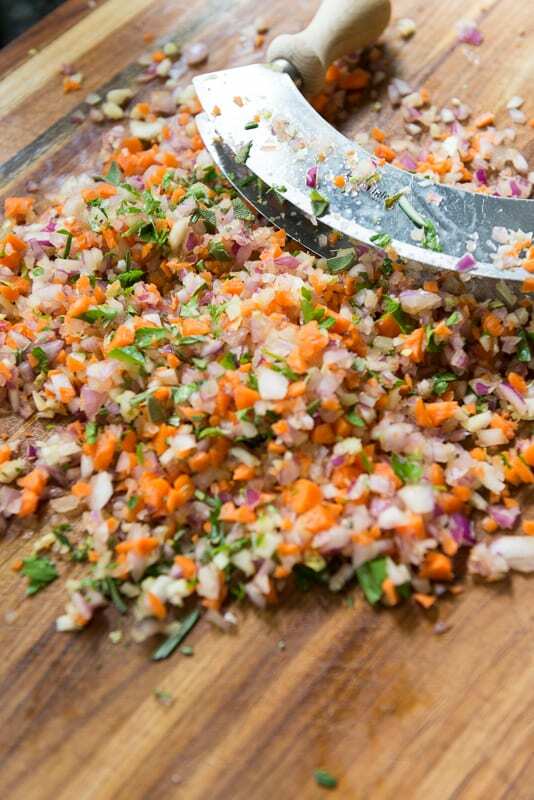 Finely chop the onion, carrot, celery and herbs together into a rough paste. In a saucepan or braiser, sauté the vegetables and herbs gently in olive oil until it is perfectly tender, taking care not to brown the onions. A pinch of salt and a few drops of water as you sauté will help things along and avoid browning. Add a splash of red wine and let it evaporate. Then add the tomatoes to the pot. Let everything simmer for a good 30 minutes or so, stirring from time to time, until you have a nice, thick sauce. I’ve never tried it, but why not? The sauce has lots of flavor. I’d give it a shot. I love sugo finto, it’s so rustic and simple and for me, it smells home and the countryside where my nonno has grown his tomatoes for more than 50 years. I can smell it even now. Gorgeous pics too! Glad that this post could bring back those wonderful memories, Linda! I always enjoy reading your posts Frank. They are chocl full of useful information. But work – or life (fun things that n my case) does lead to less frequent postings. So be it. It should be fun, not work. So take all the time you need. Thanks for your understanding, Linda! This is a must-try: simple, old-school and yet so rich and delicious! We love that you added parsley AND sage AND rosemary in the sauce, it must be so flavorful Frank! As for posting not so often, we totally get it. Life forced to take a break for some MONTHS back in 2016, but you always return to blogging, as it’s what we all love and do with our hearts isn’t it? Love this recipe; making it tonight, thank you. Yes, it’s lovely for summer. Thanks for stopping by, Paola! nonostante le mie origini per metà campane un sugo così non ricordo di averlo mai mangiato, devo rimediare, prendo nota e voglio farlo appena possibile, grazie Frank ! Frank, I find it sad that so many Italian restaurants outside Italy, even those managed and run by Italians, feature pretty much only pasta, pizzas and uninteresting meat-centric dishes such as veal parmigiana you mention. They rarely have the type of stews and other inventive dishes Rachel Roddy describes in her blog, or things like a pasta sauce made from chicken livers (where I live I can get duck livers, and I don’t mean foie gras – putting that in pasta dishes is simply pretentious and a waste). I’m not a vegetarian, but eat very little mammalian meat. My sauce this time didn’t wind up truly “finto/finta” or vegetarian, as I added a bit of the fatty part of an excellent pancetta end I bought cheap at Fruiterie Milano (not just a greengrocers, but a supermarket of a kind often found in Italian towns and cities, with several existing businesses joined together). They have a bin with “ends” of cold meats and some cheeses like provolone, marked down, for pasta, soups, salads and company. http://www.milanofruiterie.com/ Trilingual site (French/English/Italian) they also have staff who speak Spanish, Arabic (from the Maghreb) and other languages. But I highly doubt the friend from Argentina who has returned to Montréal this week will mind, given their love of meat. She is mostly Basque, but does have ancestors from Umbria. I was careful not to make it spicy; most Argies follow the palate of their ancestors, mostly from northern Italy and northern Spain. Savoury food, but not spicy. Sounds delicious to me. In some versions of the dish, some meat broth is added after the wine, so adding bits of cured meat seems to me perfectly in sync with tradition. That is great. Good recipe and I learned some terminology that I did not know. Thank you and subscribed! Thank you Ben for your readership! Its all about developing the flavors, and this is the perfect example of that. Of course I have missed your new posts, however I completely understand as I have reposted for the past 8 weeks. Business does interfere however I am back in the swing at least for now. I must say that I have enjoyed all of your reposts very much – I need a reminder these days and honestly they have been a delight to reread. I love your blogposts, Frank, but don’t really “miss” them as I know that you are a busy professional and that this blog is a pleasant and useful avocation, appreciated by many. Definitely about developing flavors! Thanks for your kind words. I guess we both know what it’s like to juggle blogging and “real life”. I’ve never heard of this, and within a few days I’ve now seen two blog post on it. The sauce sounds wonderful – I wouldn’t miss the meat at all. This might be the basis of a Giuliani Bugiali recipe I’ve made called a tomato tart, where a rich, somewhat vegetable-infused sauce is reduced, them mixed with eggs and cream. Incredible. In fact, I need to make that again soon! Thank you! Does sound similar. Bugialli has a version of this sauce, I believe, which he calls by its alternate name, sugo scappato. I have missed your regular posts! Hope that your workload will leave you more time to do what you love. 🙂 The sugo finto is something my mamma would make and in just the way you described. Our meat consumption was not what is found in most American homes. But whatever we ate it was delicious. I’ll have to make some sugo finto, mamma never worked from a recipe so I’ll have to use yours. I think that way of eating less meat without actually being vegetarian is very typical of Italian food culture, especially southern Italian food culture. It’s been lost on most Italian-Americans. In fact, just the opposite. Italian-American cooking is often meat-centric, adding meat to originally vegetarian dishes: think Veal Parmesan. But a few of us have kept the older way of eating, and I think we’re lucky. I make somethings similar, but often add mushrooms and/or eggplant to the mix. Those are truly “fake meat” vegetables. Rachel Roddy is a young Englishwoman who lives in Testaccio Rome with her Sicilian husband and their little boy. She does good home cooking, mostly Roman, sometimes Sicilian or from elsewhere in Italy, sometimes from her native UK. Well-written and unpretentious. I enjoy Rachel’s blog as well. Brings me back to Rome, if only virtually. I am glad you are back with this wonderful recipe. I am always on the lookout for a new tomato sauce recipe and this one looks great. Thank you . That’s fantastic, Gerlinde! So glad you liked it. Work life can be annoying, can’t it? Always happy to see you post, so I hope your time crunch does ease up. Anyway, what a nice recipe! I make something rather similar (I suppose we all do), although usually omit the carrot and add garlic (I know a lot of people frown on the garlic/onion combo, but I like it. Just shoot me.) Good stuff — thanks. I’ve got no problem the garlic and onion combination. Use it all the time. How else would you make a classic pummarola? My mother’s family was Barese and they spoke a different dialect so they didn’t know what Sugu Findu was, they thought it was just a Sicilian dialect name. But “Finto” makes perfect sense. And it probably got bent into “Findu” by the first and second generations here in America. Thanks for making my day, Frank! Wow, glad I could clear that up for you, Janet! Interesting. The difference between a ‘salsa’ and a ‘sugo’ is one that I’ve found pretty elusive, but some friends tell me a salsa is made with only tomatoes, no meat or vegetables added to the mix, essentially a synonym of passata. But opinions (or terminology) differs a lot. Thanks, Virginia. It’s nice to be back. Sorry to hear you’ve been swamped with work, but it happens. I go through “post droughts” usually because I’m traveling and I just can’t do both (I’m never in one place long enough to sit at a desk)! I’ve made this sauce, but had no idea that it was called “fake sauce”–makes sense, though. My daughter is traveling in Italy right now and is going to see our family tomorrow. I’m sure she’ll be happy to have some home-cooked food! As much as I enjoy well made restaurant food, home cooked food is the best!